Object Algebras are a recently introduced design pattern to make the implementation of recursive data types more extensible. 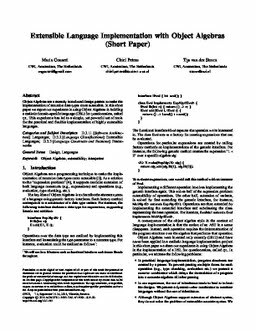 In this short paper we report our experience in using Object Algebras in building a realistic domain-specific language (DSL) for questionnaires, called QL. This experience has lead to a simple, yet powerful set of tools for the practical and flexible implementation of highly extensible languages.